Google Mobilegeddon: How can I recover from it? So you have probably read the news in recent days that Google is unleashing its latest update that will hit websites that are not mobile friendly? It’s called ‘Google Mobilegeddon’. Panicking yet? Well, this ‘Mobilegeddon’ change has been in the pipeline for a while and is happening TODAY! Unless you have a team of developers in your basement that are ready to immediately spring into action then you may be in a bit of trouble, well, for the short term anyway. Why is Google Mobilegeddon and why are they enforcing this update? Google is and has always been about usability. It now dominates the search world with 90% market share in the UK because it has kept things easy for users and has worked hard to deliver the best search results. People generally know that they will get the web pages they need when they search go to Google. With the other search engines it’s a little bit hit and miss plus you get bombarded with bloody Kardashian gossip or tons of ads on the actual search page. Rather off-putting for some. Over the past 18 months or so, Google has been focusing more on the quality of the websites that it actually sends people to. These sites must be relevant, non-spammy and also be useable. Websites with high-bounce rates obviously don’t deliver the results people want so they will be kicked down the search results. The reason for high bounce rates could be down to poor content, spammy content or the fact that they are not really useable on a mobile phone. I know most sites can be viewed on a phone but are they really usable? Can you easily read the text, click the buttons and navigation around them? Can you buy from them? In many cases the answer is no. This means you will be hit by the Google Mobilegeddon update. This is what Google is clamping down on. If you site falls into this category then you could be in for some short-term pain. If you are not sure whether your website is or isn’t Google friendly then run your very own Google mobile test here. What can I do to regain my search ranking and traffic? The answer is simple – build a new site that works for mobile device users. I know this is possibly not the answer that you wanted to hear but if you want to grow your business then you have to cater for people visiting your site on phones. If you look at your site analytics you will probably see that approximately 30% of your visitors arrive on a mobile device. This will only increase over the coming months as people start to buy more handsets with larger screens (like the iPhone 6 Plus or the many Phablets). People are glued to their phones these days and that trend or ‘addiction’ isn’t going anywhere. Should I build a new website just for mobile users? There are two options really. Build a site for mobile users to run along side your existing desktop site or build a new site / add a new skin that is mobile friendly to my existing one. In my opinion, you should only have one site that you manage which is responsive depending on the user’s device. Running two separate sites will only make managing them more difficult, time-consuming and it will make SEO a bit of a nightmare. Moving forward it isn’t really a long-term option. 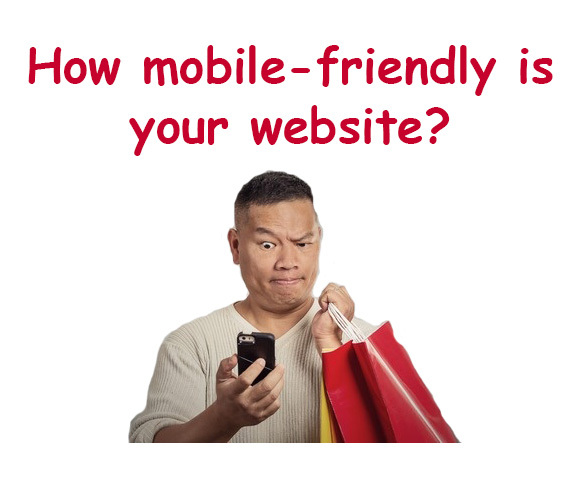 Is building a mobile friendly site worth the investment? Of course it is. If you don’t do it then you are limiting you reach and losing potential business. As much as you may not like it, you need to keep Google on side as it pretty much makes the rules so you have to keep dancing to it’s tune or suffer the consequences. However, it’s not all doom and gloom. Google is really only trying to offer the best experience for the user – i.e your customers. The better the experience they have, the more chance you have of converting visitors into sales and growing your business. It’s short-term pain for long-term gain, as they say. How can I ensure my new site is Google friendly? Simple Design – You don’t need to have a complex navigation structure or have lots of little links or buttons. Mobile screens are small to KISS (Keep It Simple Stupid). Quick Load Time – Mobile bandwidths are getting quicker but you should still aim for maximum loading speeds. Make sure your images are optimised to load quickly so your customers load the page and stay on your site. Not too much text – Mobile users want an easy-to-view site. They don’t want to read lines and lines of text. Make your pages quick and simple to read. Clear call-to-action – Make sure your buttons are clear and easy to click. More importantly, make sure they are visible! The final point is to test your website on a number of mobile phones. Ask your friends to test it for you as they will provide an unbiased view of what works and what doesn’t. Also make sure your site fits with Google guidelines by running the mobile friendly text I mentioned earlier. My advice is to follow Google’s guidelines very carefully, don’t ignore them and never try to cut corners or use trickery to gain an unfair advantage. Get you mobile site built and start to embrace the mobile customer. They are the now and the future. If you need some help or advice in making your website mobile friendly to avert Google Mobilegeddon then feel free to contact me.